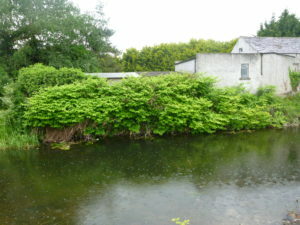 Japanese Knotweed (Fallopia japonica) on the banks of the Royal Canal, Co. Kildare. Photo by John Brophy. Alien invasive species (AIS) or non-native invasive species pose a threat to Ireland’s biodiversity and can also have human health and economic impacts. It is important to be aware if any AISs are present on a development site, as construction and demolition works can result in the spread of these species to other sites. Under the European Communities (Birds and Natural Habitats) Regulations 2011 (S.I. 477 of 2011), it is an offence to spread or allow the spread of such plants and animals. Commonly found species that are considered AISs under these regulations include Japanese Knotweed (Fallopia japonica), Indian Balsam (Impatiens glandulifera), Giant Hogweed (Heracleum mantegazzianum) and Rhododendron (Rhododendron ponticum). As well as terrestrial species, it is necessary to consider aquatic AISs such as Curly Waterweed (Lagarosiphon major), Zebra Mussel (Dreissena polymorpha) and Water Fern (Azolla filiculoides). BEC Consultants provides a range of services in relation to alien invasive species, including site survey and contribution to the preparation of AIS management plans. AIS management plans provide for the proper treatment and, if necessary, removal of AISs present on a site, and recommend biosecurity measures to prevent the spread of the species. The provision of these services allows us to carry out stand-alone AIS survey, as well as contribute to Environmental Impact Assessments, Appropriate Assessments and planning applications. BEC Consultants has provided AIS reports for a range of clients including Cork City Council in relation to Japanese Knotweed along the Trabeg River, JB Barry & Partners Consulting Engineers for Loughshinny wastewater pumping station upgrade, Irish water for a range of infrastructure sites, and prepared an assessment of Rhododendron in Killarney National Park for the National Parks & Wildlife Service.